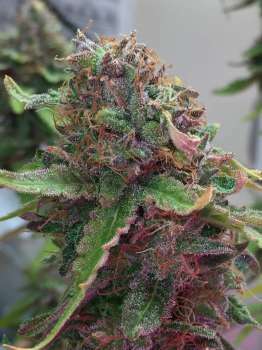 Here you can find a strain description about Shock Trauma and also some user-based reviews and infos directly from the SeedFinder (if available). You can also find the offers and auctions here if Shock Trauma cannabis seeds are on stock at MyCannapot right now. Shock Trauma (Medijuana x Night Nurse) is a indica F2 hybrid with a 1:1 cbd/thc ratio. A medicinal strain with a high level of thc and cbd. Shock Trauma smooth earthy heavy indica draw, with a flowery aromatic air. Traits pulled from its Night Nurse mother. Pungent and smooth with an almost chocolate flavor. Be ready to be medicated by its very strong sedative effect, which comes from Dad, Medijuana. The high CBD provides the pain relief, while an equally high dose of THC does all the rest. Powerful head buzz takes away all anxiety along with possibly short term memory. Warm waves of pleasure surge through the body the perfect relaxation and sleep aid. Good medication for chronic pain, stress, and depression. Also good for PTSD, fibromyalgia and PMS. Flowering period is about 60 days. Buy Shock Trauma now at MyCannapot!